I grew up playing at the end of a now unrecognizable hockey era. We were literally taught to clutch and grab. 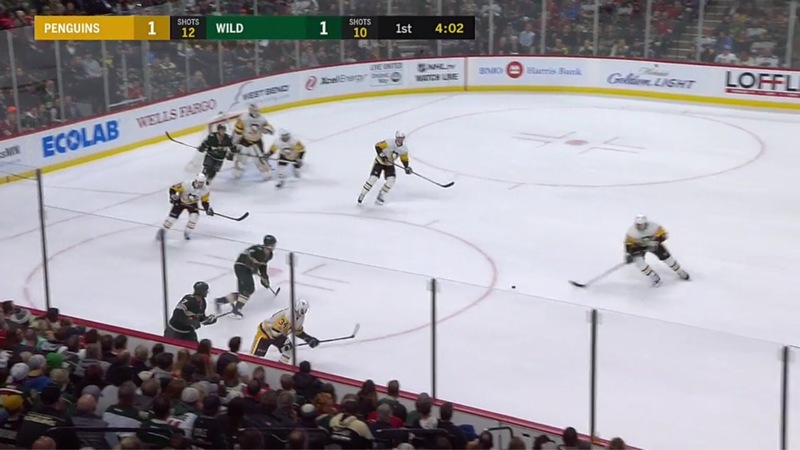 There was an actual back checking drill where you’d hook a guy through the neutral zone so he couldn’t charge your defenseman going back to get the puck, and then you’d time letting him go so when your defenceman was ready with possession, the forechecker would be about halfway between you and the puck, leaving your defenceman safe and you wide open for the pass. It was blatant strategic obstruction. Obviously over the years the NHL sought to get rid of that. The obstruction interference rule was introduced. The red line was taken out. It was all about stretch passes and speed. For decades they thought opening up the game would lead to more offence and less frustration. But the people behind the scenes of individual teams are smart. They’re part of an NHL organization for a reason. Coaches are front and centre, but what about those video analysis guys? The special teams guys? The strategists who provide vital information to coaches and players? The Pittsburgh Penguins organization is littered with hockey geniuses. I’d have to believe the video teams and opponent breakdown people are some of the best. As the game looked for three line passes and end to end action, teams adapted almost immediately to defend this revolution that was supposed to let superstars be superstars and increase scoring. Since the “real crackdown” on obstruction after the 2005 NHL lockout, what we’ve seen in reality is success by teams who know how to slow the game down in other ways. Of the 12 Stanley Cup Championships since 2005, eight of them were won by three teams (Pittsburgh – 3, Chicago – 3, and Los Angeles – 2), and a ninth Cup was won by the franchise those other three tried to emulate: the 2008 Mike Babcock coached Detroit Red Wings. Oddly enough, Mike Babcock used to be the coach of the Anaheim Ducks, who reached the 2003 finals, losing to the not so offensive minded New Jersey Devils. The Anaheim franchise went on to win its Cup in 2007. The formula for victory of these repeatedly winning teams isn’t overwhelming oppponents with long range passes. It isn’t spreading the ice out, or racing up and down in a series of back forth end to end blitzes. It’s now a game of possession. Instead of spreading out, it’s keeping close and methodically picking your way up the ice together. Instead of two defencemen and three forwards it’s a unit of 5 players making coordinated 5-10 foot passes, staying close enough to make the pass easy but far enough away from each other that one opponent can’t defend two of you. This is a concept that was perfected by the Detroit Red Wings early on. It was adapted by the most successful teams over the past 12 years, including the Penguins. Now, the Mike Sullivan era Pittsburgh Penguins and their video staff have also discovered the antidote. There’s one difference between the Penguins and the other dominant post obstruction teams. The Blackhawks, the Kings, the Bruins, the Sharks, the Ducks, the Lightning, and the Wings ALL consistently finish in the NHL top 10 for fewest shots on goal against. They frequently appear in the top 5 even. The Penguins repeatedly finish in the BOTTOM 5. I’ve said before that I don’t really buy into the whole shot differential being that important, but I just want to show how the Pens have never had the extremely deep defensive core of the Red Wings or the Blackhawks or the Kings or the Bruins. They’ve had Kris Letang and a handful of known unprovens who are always listed as the team liability and always mentioned as the thing the team wins in spite of, not because of. They’ve had Marc-Andre Fleury and, for the past two championships and beyond, Matt Murray. The Penguins have always relied on a team defense. On that philosophy, this season in particular they’ve made one more pivotal strategic adjustment. The team as a unit of 5 collapses very low in the defensive zone and stays very tight together. 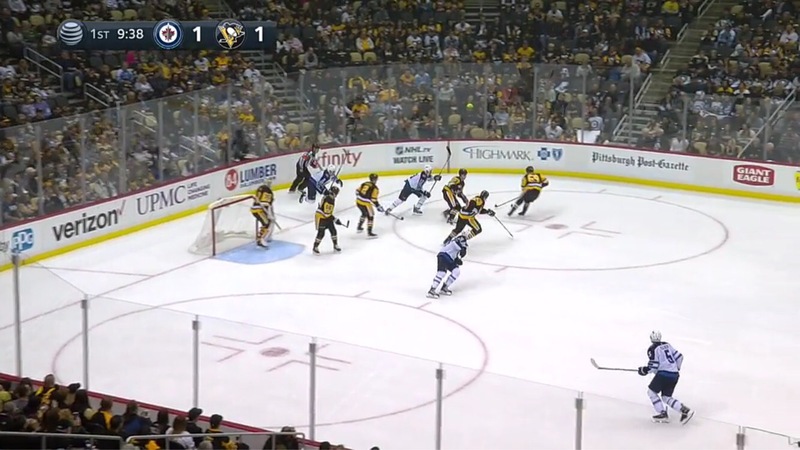 After being opened up for 10 goals in Chicago earlier this year and giving up 7 to Tampa Bay last Saturday, the Penguins have really bought into their defensive zone formation with renewed vigour. They divide the defensive zone into 4 quadrants. As you can see, all five Penguins stay in the same half top to bottom. They also stay in the same half side to side, which means more often than not, the whole five man unit packs itself into the same little quadrant. Over the past week this has resulted in giving up a total of just 4 combined goals (1,1,2) in three games. The Penguins sit 27th in league shots on goal against for the season which is nothing new(32.7), but during this three game span they’ve only allowed 31 shots or less in each, and the quality of the scoring chances they gave up have been less dangerous. This defensive concept isn’t by any means. It’s just usually associated with teams that aren’t offensively gifted as a means to clog things up and hope for the best against superior competition. 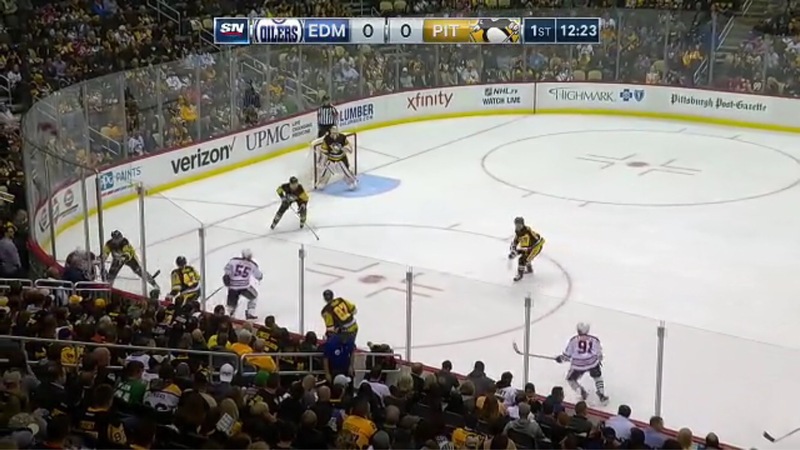 What the Penguins benefit from by using this system isn’t just defensive. As soon as they gain possession in this formation, now those 5-10 foot passes they love for attacking are already available. It’s instant transition. Plus, it pulls the other team down because they feel like there’s no danger behind them. But every now and again you’ll see one or more of the forwards take off for that deep attempt. It’s like a quarterback throwing for 4-5 yards over and over again, forcing the defense to finally step into those holes, and then going over the top into a now depleted secondary. The Penguins can and will beat you with long passes and speed, but those holes and opportunities are better created when everyone starts from the very back.